Special Collections and University Archives has recently enlarged its holdings of materials related to British designer William Morris (1834-1896), including the purchase of two printed leaves from Kelmscott Press’s The works of Geoffrey Chaucer and the cataloguing of a sixteenth century book printed by Wynken de Worde that was previously part of Morris’s personal library at Kelmscott House. 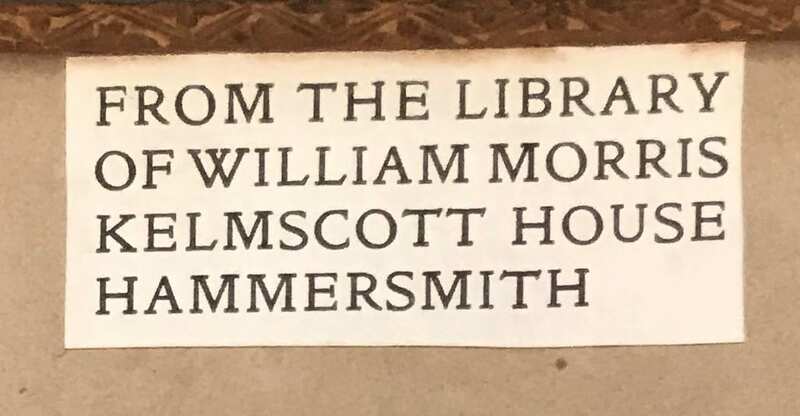 We recognize William Morris as one of the previous owners of this copy through the presence of his bookplate on the interior cover that reads, “From the library of William Morris, Kelmscott House, Hammersmith.” In addition to Morris’s work in design and bookmaking with the Kelmscott Press, he also was an avid book collector and held many volumes in his personal library. His library included a wide range of books, from medieval manuscripts and incunabula to contemporary nineteenth century works. 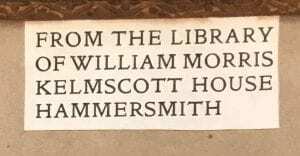 Most recently, scholars William S. Peterson and Sylvia Holton Peterson have been compiling a catalogue of Morris’s library to record the provenance and current locations of the books and manuscripts previously owned at Kelmscott House, which currently includes 2,400 entries. 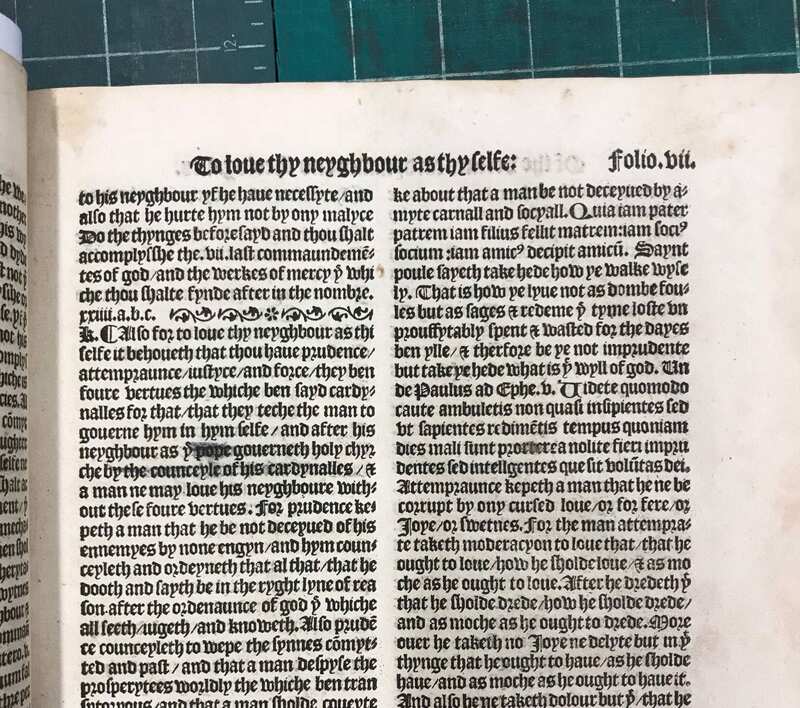 UO Special Collections and University Archives also holds a second book bearing Morris’s bookplate from Kelmscott House, Astesano’s Summa de casibus conscientiae, a fifteenth century work on canon law. These two books from Morris’s library came to Special Collections and University Archives with the 1980 acquisition of Bishop William A. Quayle’s collection of books on the history of printing. 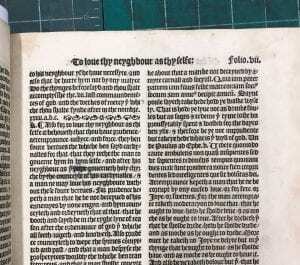 Special Collections and University Archives also holds two printed leaves from Morris’s most celebrated work, The works of Geoffrey Chaucer, now newly imprinted, published in 1896 by the Kelmscott Press. 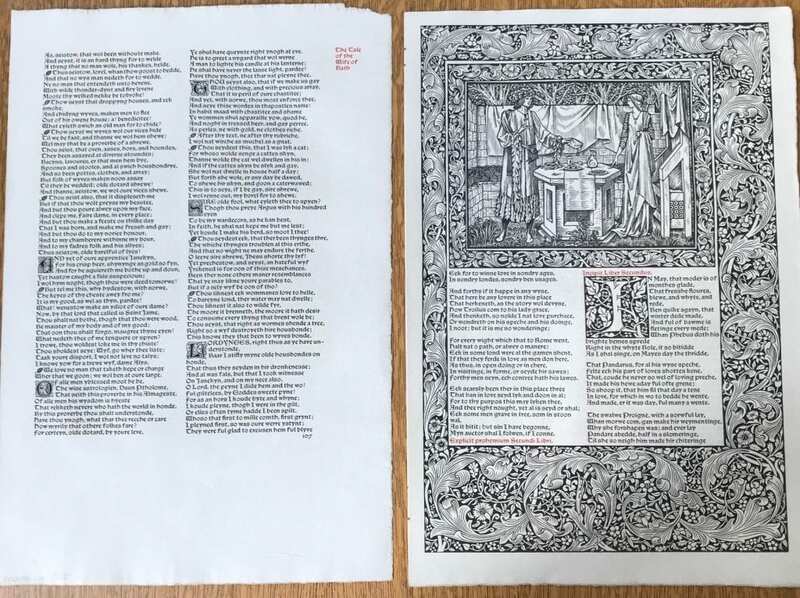 The Kelmscott Chaucer is heralded as “the culmination of Morris’s work as a master craftsman and of his collaboration and friendship with Burne-Jones.”1 These finely printed leaves are specimen of Morris’s idealized “the book beautiful” and of book design during the Arts and Crafts movement. The two leaves are printed in red and black ink on paper and measure 43cm tall. The first leaf (signed h6, pages 107-108) contains lines from “The Tale of the Wife of Bath” from the Canterbury Tales. 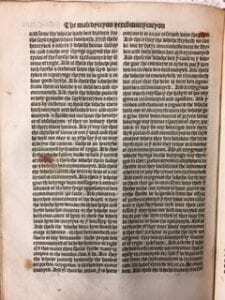 The second leaf (signed ii2, pages -484) contains text from the second and third pages of the second book of Troilus and Criseyde. 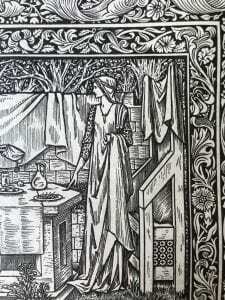 The latter leaf also includes an illustration cut by Pre-Raphaelite artist and Morris collaborator, Edward Burne-Jones (1833-1898). The decorative borders, initials, and font were designed by William Morris. These works supplement a modest collection of other works published by the Kelmscott Press and William Morris held by Special Collections and University Archives including: The Nature of Gothic: A Chapter of the Stones of Venice (1892), The Recuyell of the Histories of Troye (1892), Maud: A Monodrama (1893), The Wood Beyond the World (1894), Of the Friendship of Amis and Amile (1894), and The Shepheardes Calendar (1896) and others. Richmond, Velma Bourgeois. 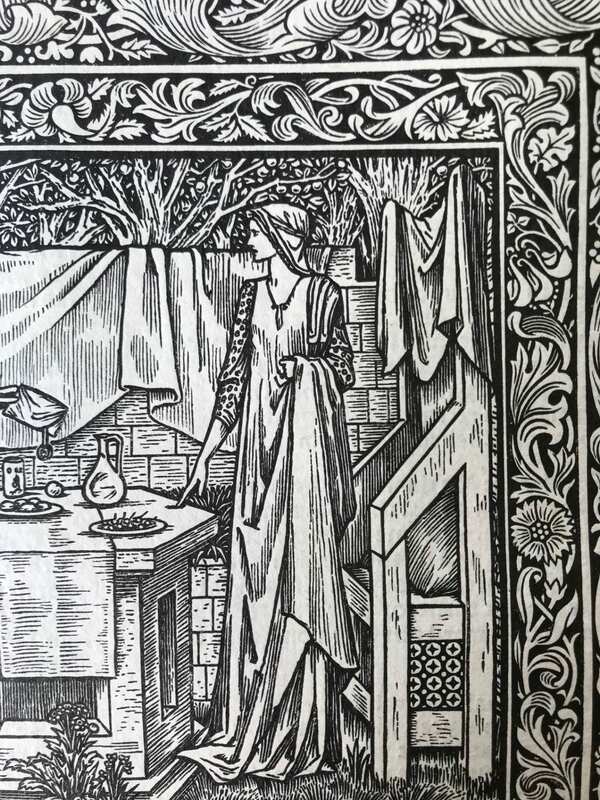 “Edward Burne-Jones’s Chaucer Portraits in the Kelmscott “Chaucer”. The Chaucer Review 40, no. 1 (2005): 1-38.